Trolley carted its way into the lifestyle arena at hip Amoy Street last September. Here, you will find a range of interesting in-house products like side tables, handmade cushions, tetris-inspired display racks, mirrors and consoles designed by owners themselves who believe in a creative process that enhances one’s lifestyle and surrounding. Items sold here not only need to be functional but they must be good-looking and developed from good design concepts. 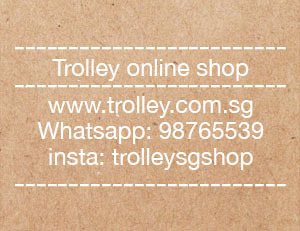 At Trolley, you will also come across many whimsical yet chic lifestyle award-winning designer clocks, fans, rugs and an array of other home accessories. Sourced from all over the world, it’s the first time that these products from well-known brands such as Elmar Flototto, Stadler Form and Duo Design have stepped foot into Singapore. Another important thing to bear in mind is that most of what is sold here come in limited pieces. Hence, if something catches your eye, be sure to place it in your shopping cart because it may just be sold off the next day. Hope this mail finds you in good health and cheer. I just came across your site through GOOGLE search and wanted to inform you that we offer you FREE seo services such as article submission, directory submissions, social bookmarking and articles for your website at FREE of cost. This will help increase your site traffic,Page Rank and SERP. In return we need simple text links from your site. If you are interested kindly advice me on this. Eagerly awaiting for your valuable reply. I was looking at the Jigsaw rug that was under the Spice table. Wonder if you are selling them in trolley and how much does it costs?? Does it comes with a standard design and how to maintain them?? Greatly appreciate for your reply.